All the furniture that we have available for sale in our store in Merrickville is solid wood, it is not made with particle board, laminates or MDF (medium density fiberboard). These pieces are made one at a time in Ontario as ordered, they are not mass produced in a far away land & shipped in large quantities unassembled. 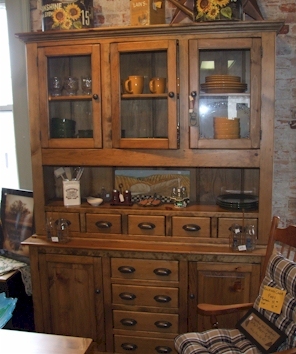 Both of our furniture suppliers offer many different finishes including stains, paints, antiquing & distressing. We try to stock a wide variety of pieces but due to space constrictions we are not able to stock all pieces shown on sites. This furniture is Canadian made in Minesing, Ontario just a few minutes north of Barrie and is available only in solid pine. Please click on their website link below for more details. This furniture is Canadian made in Pickering, Ontario and is available in solid pine and wild maple (a hardwood that includes knots & checks at a 20% premium). Please click on their website link below for more details. For more information and/or a price quote on a piece(s) of furniture found in the website links above please contact Ken at the email link below. Please include the supplier name & the item number for the piece(s) in question.